When we speak about Tuscany many thinks come up to mind such as its towns full of artistic treasures , its mild climate , its hills with Romanic churches,restored cottages, its olive groves and woods. Among these hills you can find the farm “Tenuta Buccialla” owned by Baronti’s family since 1900 and its holiday farm ” Poggio al Sole” . 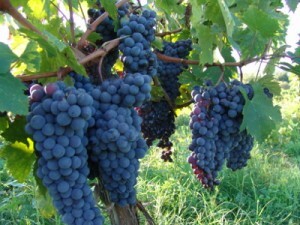 ” Tenuta Buccialla ” belonged to the earls Masetti della Gheradesca , branch of the famous earl Ugolino of Dantes’s memory. 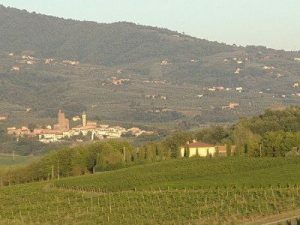 The estate is situated a few chilometres far from Vinci ( the native town of Leonardo da Vinci) on a hill surrounded by vineyards , olive groves, cherries trees and wild walnut trees. Grappa del Chianti and Vin Santo . Here you can buy and taste our Products . 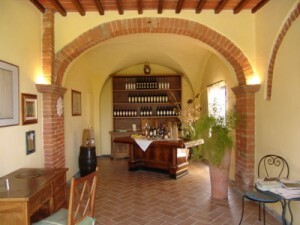 In the old estate a farmhouse has been restored and divided in 6 flats with the typical features of the Tuscan cottages such as wood beams, old cotto tiles, old arches in sight………. The holiday farm is surrounded by a big garden with a panoramic swimming pool , gazebos , a barbecue corner and a big car park. 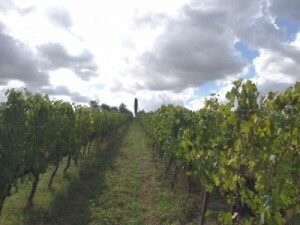 Vinci is situated in Lower Valdarno, on the northwest slopes of Montalbano, 30 km. 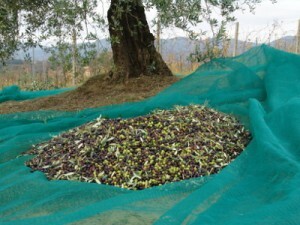 from Florence, close to the major cities of Tuscany: Lucca, Pisa, Pistoia and Siena. The old center, with the castle and the parish church, stands on a small hill (m.97), while the town occupies the hill decline: several hamlets are scattered between east, south and west. 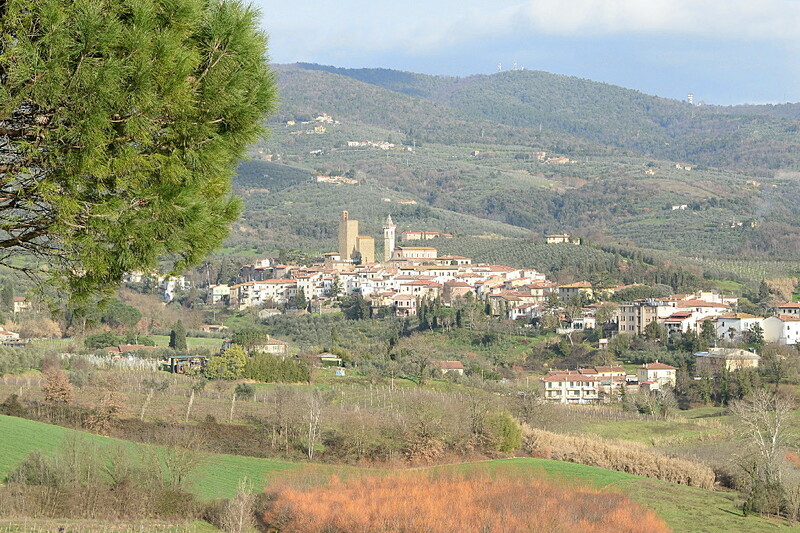 The protected area of Montalbano extends for 16,000 hectares to the north of the City until you reach the town of Montecatini Terme and Florence. 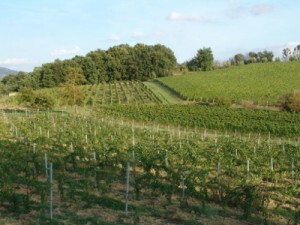 The dominant landscape is hilly with the screw that continues to be grown near the floor or in some terracing, the common trees in the higher areas and forests of chestnut trees, a typical example of induced vegetation on top.The area is particularly suitable for walking and hiking. You can carry through a network of foot and cycle paths which reach hilly town surrounded by green, archaeological sites, ancient forests like the ilex grove of Pietramarina. Museo Leonardiano – The exposition was created in 1935 castle of Conti Guidi; it is composite by many models of machine inspired by Leonardo’s drawings. The new layout was created in 1986, there are many models accompanied by descriptions and it has also been set up a room with audiovisual. Museo Leonardiano – Palazzina Uzielli – Branch of the Museo Leonardiano, the new museum complex together with the leonardiana library, It is proposed as a documentation center on Leonardo and his time. Museo Ideale Leonardo da Vinci – the first museo ideale in the world was born in Vinci in october 1993: it is dedicated to the universal genie of Leonardo, its art, its land and its relevance. In a place of great beauty, the museum contains over 400 works and objects: from archeology and artifacts Leonardo environment, paintings and engravings sculptures and fountains ,models of machines and ancient treatises, from exceptional pieces in minds of wonder, the database with painting and Leonardo’s drawings to works of contemporary art inspired by the great master of the Renaissance. Altogether collects more than seven monographs in various languages. Home of Leonardo – Is located at Anchiano, restored in 1986, inside there are several reproductions of Leonardo’s drawings and map of the Valdarno drawn by Leonardo himself. Church of Santa Maria Assunta – It is located in the Faltognano fraction; from the terrace in front of the church you can admire the beautiful landscape of Valdarno, in the shadow of the secular and the famous holm. Sanctuary of SS. Annunziata – We find the intersection of two main streets of Vinci. Chiesa Parrocchiale di S. Croce – Of Romanesque origin, renovated several times, the bell tower was built in 1852, its facade and the interior with three naves in 1929. Pieve di S. Giovanni – It is located a few kilometers from Vinci, in Sant’Ansano. He cited in 998 in a diploma of Otto III. During the restoration it was highlighted the Romanesque structure with three naves stone.